Turtle Grass is one of six seagrass species that occur in San Carlos Bay and Pine Island Sound. Turtle grass is abundant in high light, high salinity environments. Turtle Grass abundance and distribution is limited by temperature, low salinities and turbidity from runoff, and wave action. It is a flowering plant that provides a home for many species of fish and invertebrates, often referred to as a 'nursery' ground (Virnstein et al. 1983, Lewis 1984). T. testudinum exhibits seasonal fluctuations in productivity with the maximum standing crop, blade length and shoot density occurring in the summer months. Average leaf growth rates are 3-4 mm/leaf/day but can be as high as 12 mm/leaf/day (nearly 1 inch per day) (Zieman 1975). Turtle Grass is considered a climax species, with a low shoot turnover rate and relatively high sugar reserves stored in the roots (Gallegos et al. 1994). Therefore, it can tolerate environmental stress (low salinity, low light) for some time but exhibits sub-lethal stress in the form of slower leaf growth (Milbrandt et al. 2016) and decreased shoot density (Brown et al. 2016) near the mouth of the Caloosahatchee compared to sites in Pine Island Sound. It is not known how long this species can tolerate environmental stress but there are several examples of study sites that exhibit a shift from T. testudinum to more low salinity tolerant H. wrightii in areas frequently inundated with low salinities from runoff and regulatory discharges. 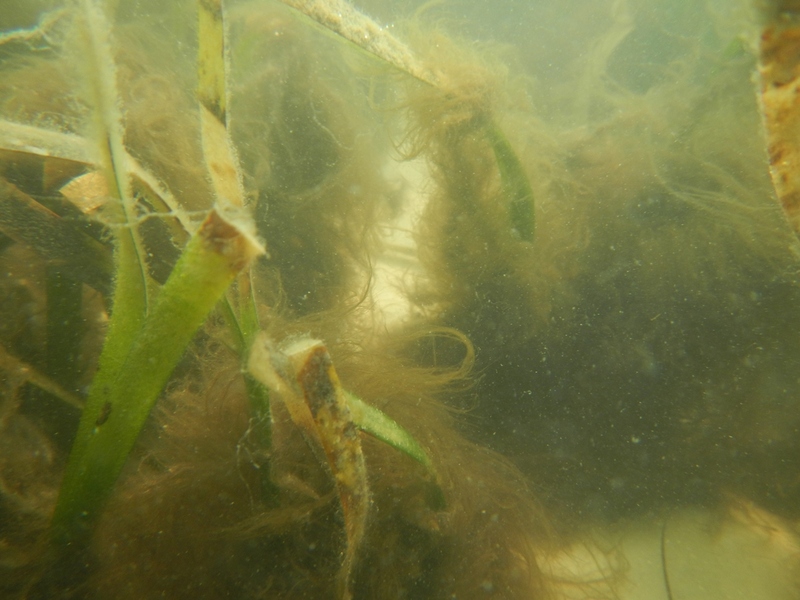 As shown, Turtle Grass in San Carlos Bay is often covered with heavy films of diatoms, macroalgae, and epiphytes due to high nutrient loading associated with urban and agricultural runoff. Turtle Grass in areas further away from urban and agricultural influences have fewer epiphytes. Salinity is a key factor determining habitat suitability for T. testudinum. Suitable habitat for Turtle Grass was associated with higher, more stable salinity (Santos et al. 2012). Salinities below 20 depressed relative growth rate in Florida Bay (Herbert et al. 2009). However, based on field-based observations of distribution and abundance, T. testudinum is found in areas with salinities between 25-40 (Greenawalt-Boswell et al. 2006), with the greatest abundances between 30-35. If salinities are maintained at 20, it is predicted that Turtle Grass would be replaced by Shoal Grass (Lirman and Cropper 2003) or macroalgae.